Strong growing large open evergreen shrub or small tree. Large dark green leaves. 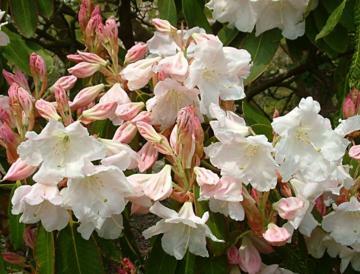 Abundantly produced, huge trusses of strongly scented, lily-like, large white flowers with pale green markings in the throats, opening from soft pink buds in mid and late spring. Loderi Group hybrid of Rh. fortunei x Rh. griffithianum, raised at Leonardslee.